Professionals can make the process of applying sealant look like child’s play, but without the right advice and a bit of practice it can actually be a nightmare to get right, especially if you are a perfectionist. When applying most compounds, such as metal bonding adhesives, you do not have to worry about neatness because often the bonded items will not be seen. However, when it comes to sealant, it is a substance that not only serves a practical purpose but also acts as the aesthetic finishing touch to a project. The results could haunt you for years, even if it is being used order to protest parking fees, as occurred in Anglesey this week. 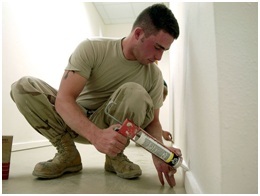 Here are a few tips on how to achieve an even and consistent finish when using sealant, many of which can also be applied more generally to the effective application of compounds like CT1 metal bonding adhesive and more. Plenty of people get poor results because they have not properly prepared the tube of sealant for use. So the first step is to bind it up in tape, ideally of the brown parcel variety, to prevent unwanted expansion during use and make sure that its contents are extruded with precision, with no overrun. Next comes the cutting of the tube’s integrated spout, which needs to be done cleanly and at an angle of around 30 degrees. Make sure the instrument you use to make the incision is razor sharp, as this will ensure that no burrs of plastic remain behind to disrupt the flow of the sealant or adhesive. Always remember that sealant will only work effectively if it is applied to a clean, flat, dry surface. Keep a container of water to hand so that you can use your fingers to address any inconsistencies in the freshly applied sealant; this will remove the temptation to use your own saliva, since this can encourage mould growth. When you are ready to begin, get set up so that you can complete a full line of sealant application in a single manoeuvre rather than attempting a stop-start approach, which will compromise the look of the finish. A dry cloth will be idea for cleaning your hands and tidying up the edges of your work.